Festival of Holidays at the Disneyland Resort is a multicultural delight with a vibrant mix of unique food and beverage options and live entertainment. 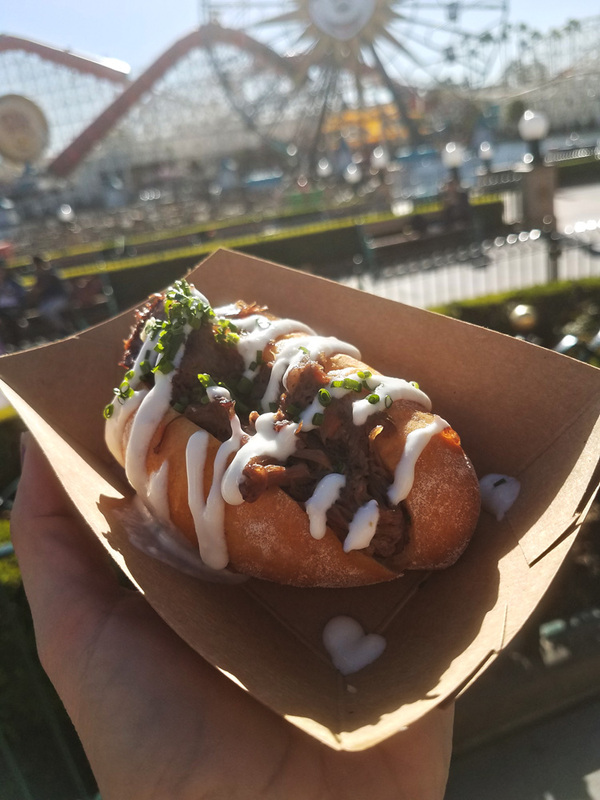 With exclusive bites available only during the event, the Festival of Holidays is truly an enjoyment for foodies. But what is there for kids to do at the Disneyland Festival of Holidays? 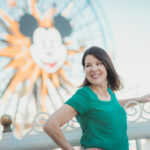 Our Day Trips TravelingMom has experienced this event with children yearly since its inception and has all the tips on what you need to know about exploring the Disney Festival of Holidays with kids. I received complimentary admission to the Disneyland Resort along with two free Festival of Holiday dining options to facilitate this post. Traveling Mom uses affiliate links that may pay us if you purchase through them. Thanks for your support. Where Does Festival of Holidays Take Place? 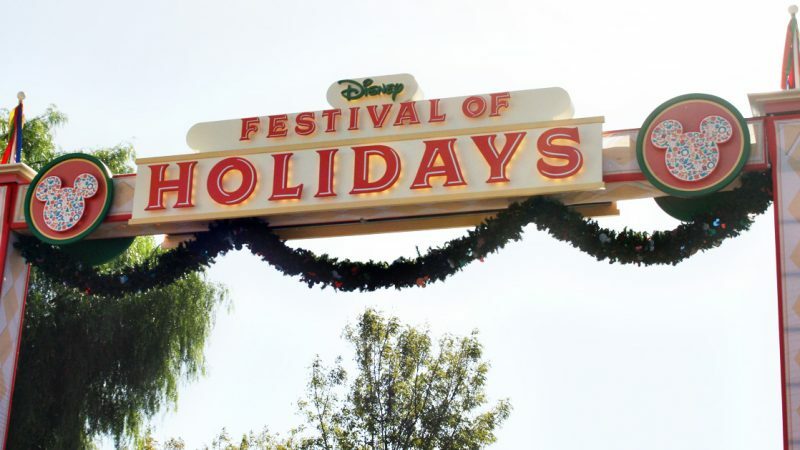 Disney Festival of Holidays takes place inside the Disney California Adventure park. 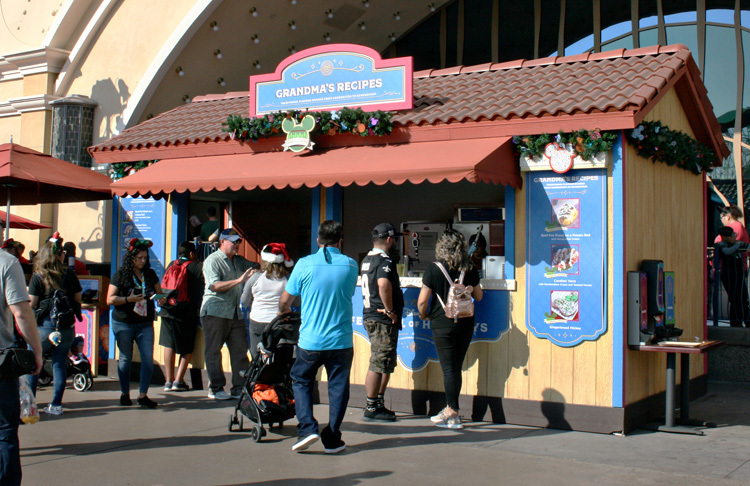 There are 12 kiosks set up in a designated “marketplace” located in the Paradise Gardens Park. 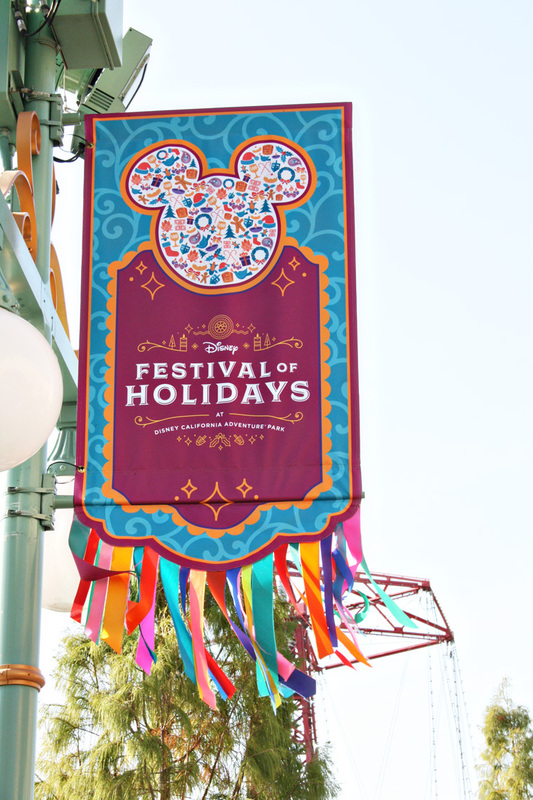 When Does Disney Festival of Holidays Run? The Disney Festival of Holidays runs from November 9th, 2018 through January 8th, 2019. Kiosks are open daily starting at 10:30 a.m. Check the Disneyland app for details on when kiosks close each night. What is the Cost of Festival of Holidays? 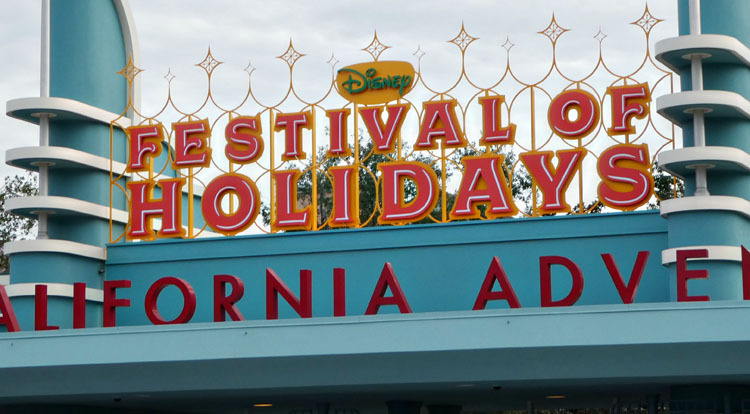 Festival of Holidays is included in the cost of your Disney California Adventure park ticket. There is no additional cost to attend the event. Food, beverages and souvenirs are an added cost (keep reading for more details). What Does Festival of Holidays Include? 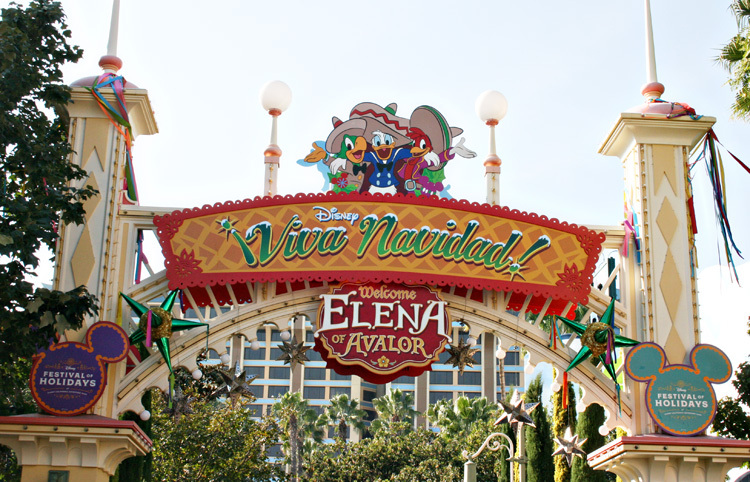 The Festival of Holidays offers a marketplace section of the park that includes 12 food and beverage kiosks, live entertainment in multiple venues, Festival souvenirs and the !Viva Navidad! street party inspired by Latino cultures. Who Would Enjoy Disneyland Festival of Holidays? 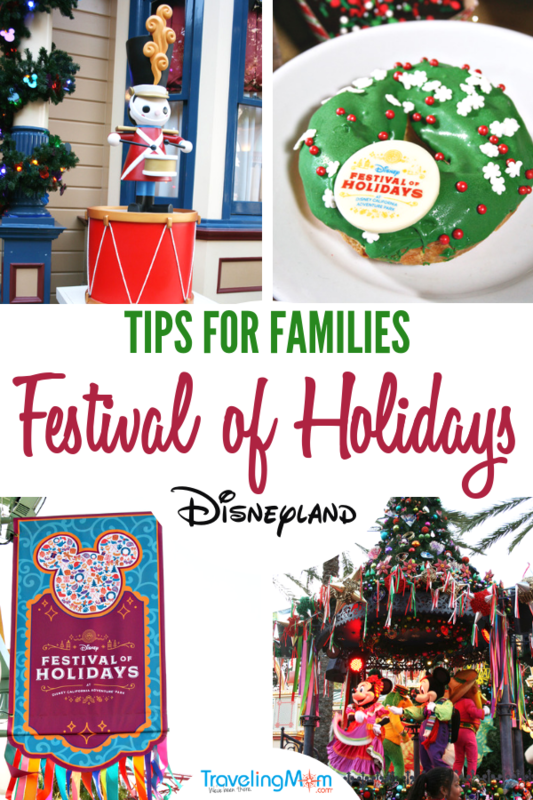 The Festival of Holidays is truly geared for all ages with something that everyone can enjoy. The event is especially geared towards adults and foodies in particular, though there are many things here for kids to enjoy. 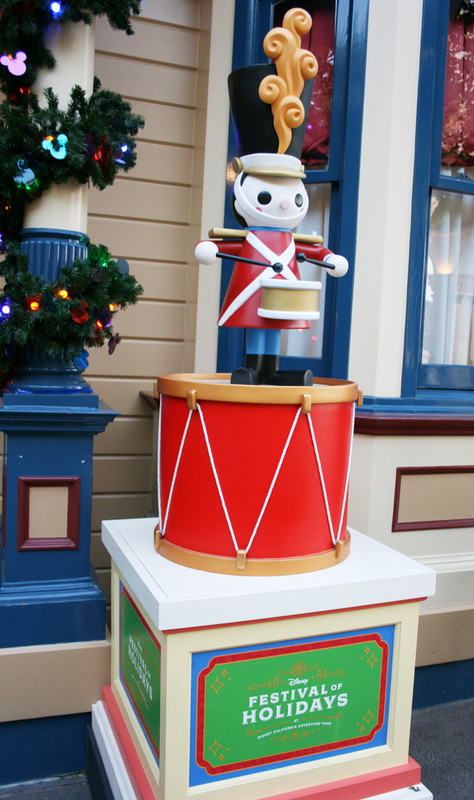 Click through for more Disneyland holiday insider tips. 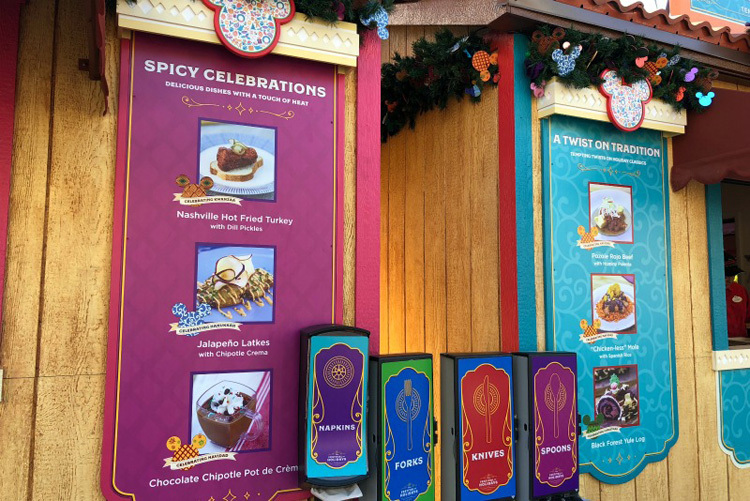 When visiting your first Marketplace kiosk, request a Disney Festival of Holidays Tasting Passport. This pocket-sized booklet includes all of the food and beverage offerings, color photos of some selections and a map to show you where to find it all. A colored dotted key on each page will also show which foods are inspired by either Christmas, Diwali, Hanukkah, Kwanzaa or Navidad. TravelingMom Tip: Take a moment when receiving your Passport to circle your must-try items. There’s also a lined note section on the inside back cover. This will help you keep track and not miss something, especially when the Marketplace is busy. Food and beverage choices vary from year to year, though some Festival favorites are carried over. I was pleased to see some of my favorites made the cut this year, including the rich and delicious Milk Chocolate Candy Cane Pot de Creme. 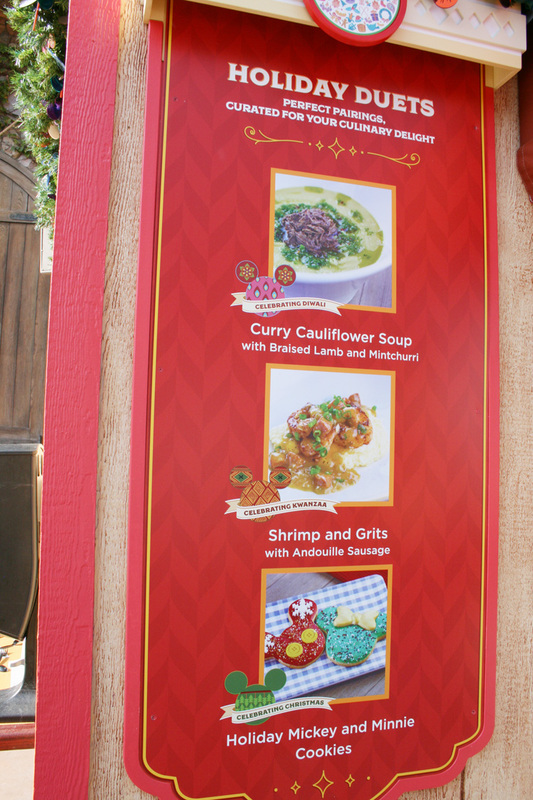 Each of the 12 Marketplace kiosks in the Disney Festival of Holidays has a menu with a photograph of the item. This really makes it easy for you to look and see quickly what items are sold at each kiosk. You’ll also have a hint of what is sold based on the names of each kiosk (like Spicy Celebrations and Blissfully Braised). I personally was able to try all of the following and each was amazing. I’m not a foodie, but everything was high-quality and delicious. It is all very good and filling food that is sure to please a wide palate. Some of the savory dish options range in prices close to a counter service entree. If you’re on a budget consider sharing one or two of these dishes and then choosing your own dessert. Dessert choices are slightly less in price. If you purchase the Sip and Savor Pass (see below for description), choose the highest cost items. These will be the savory dishes and not desserts. Read more Disneyland on a budget travel tips. 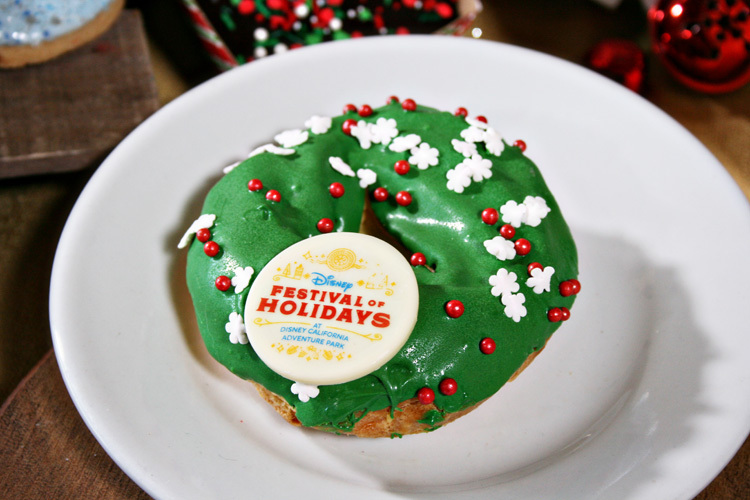 Do you have specific dining needs and not sure what you can enjoy during the Festival of Holidays event? Flip to the back of your Tasting Passport to the index. You can also take note inside the booklet at the key to direct you to gluten-friendly, vegetarian, vegan, and milk-friendly options. 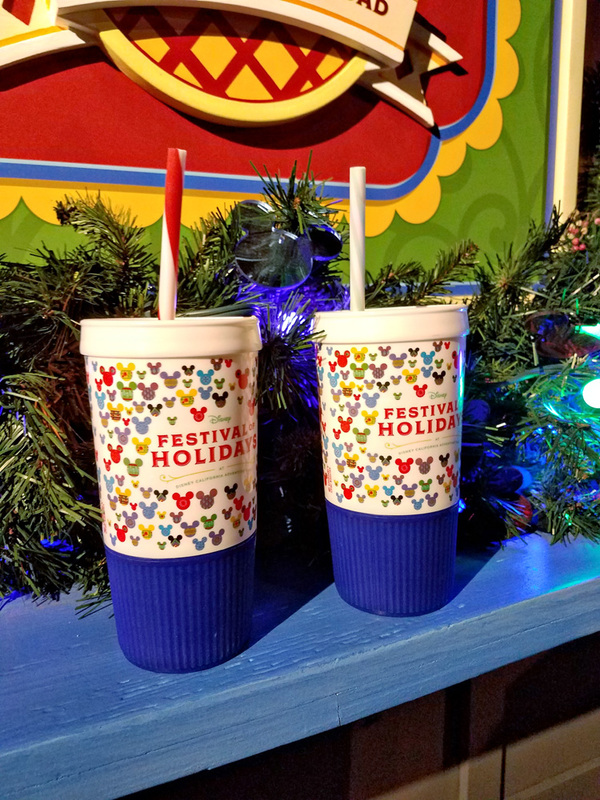 I purchased a Warm Peppermint Chocolate Float and upgraded to receive the souvenir tumbler. It was worth the few extra dollars to have something to take home with me once I was done drinking the yummy float! There are several kiosks where you can upgrade including a Holiday Punch with Lime Sherbet and Sprite (a kid-pleasing beverage, for sure!). 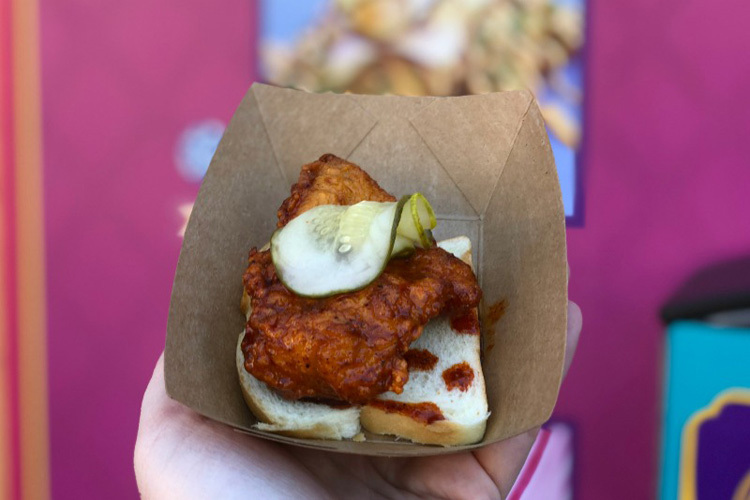 The kiosks open at 10:30 a.m. and this is likely your best bet for trying the tastes without lengthy lines. The earlier in the day the better when it comes to crowds. When I walked through the area again around 2:00 p.m. the area was extremely congested and lines were 10+ deep. 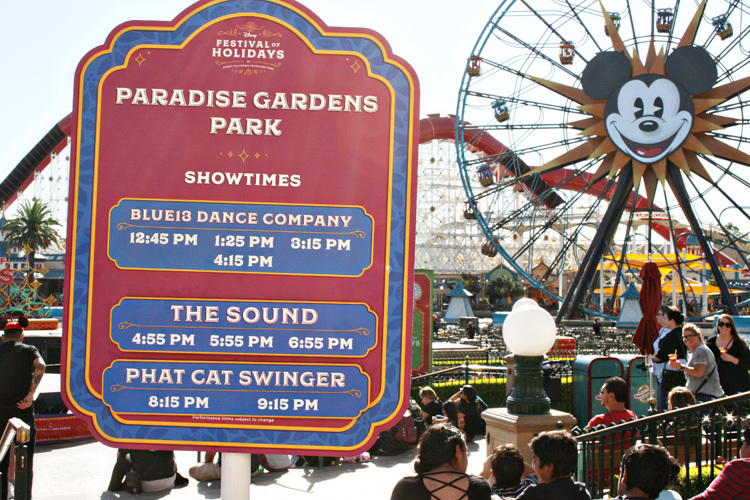 Read more about navigating holiday crowds at Disneyland. 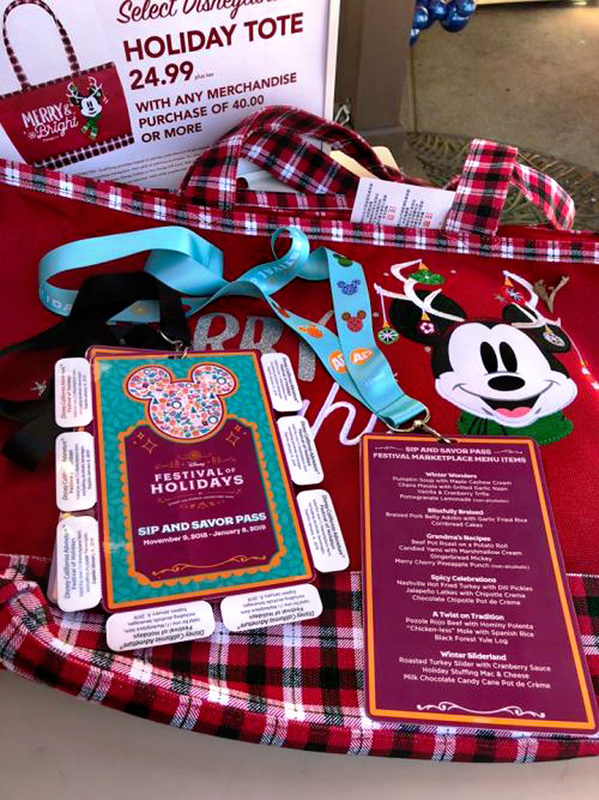 If you’re planning on trying out a lot of the dining choices during the Disney Festival of Holidays, you may want to opt for purchasing a Sip and Savor Pass. The Sip and Savor Pass entitles you to 8 food or non-alcoholic beverage items inside the Marketplace. Annual Passholders will receive a discount on their purchase when presenting their card and ID. The Sip and Savor Pass hangs from a lanyard so you can wear it around your neck (two hands free to hold more food!). Simply snap off one of the tabs when making a purchase. Savory dish options are pricier than the desserts. Choose the highest cost items to really maximize your use of the Sip and Savor Pass. TravelingMom Tip: The Sip and Savor Pass does not need to be used all in one day. You can choose to space out your choices over the course of the Festival (Nov 8th, 2018- Jan 8th, 2019) or use them all in one day. The Pass can also be shared between more than one guest. 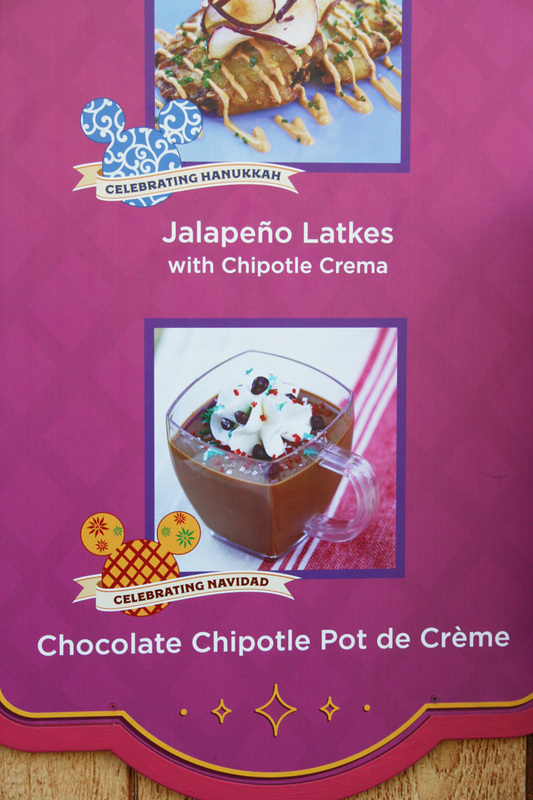 There’s truly a plethora of holiday goodies to find at the Disney Festival of Holidays. 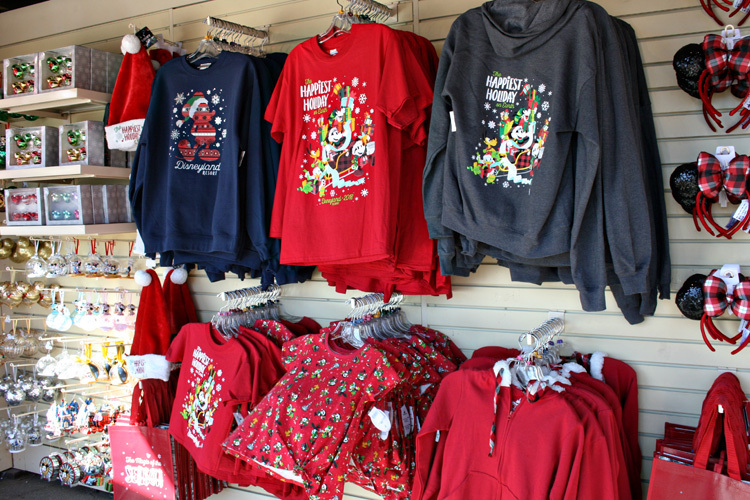 Naturally shirts and Mouse Ears abound but you can also find mugs, ornaments, stockings and hats. Christmas is the main theme in the souvenirs but I also spotted gifts from the other cultural celebrations as well. The Marketplace even had Cast Members personalizing ornaments on the spot. If you’ve fulfilled your Disney-memorabilia for the trip, consider something special from one of the outside vendors participating in the Festival Marketplace. There are macarons, bath and body products, gourmet hot sauce, and crystal treasures from Arribas Brothers. 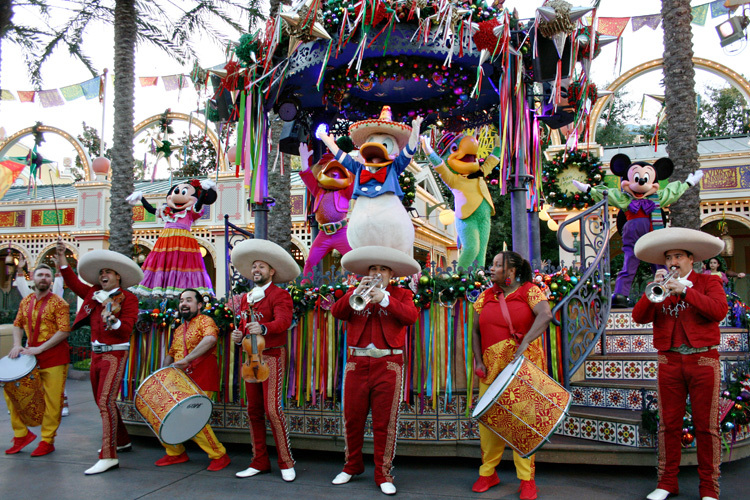 This celebration of Latin culture is a true highlight during the Disney Festival of Holidays. This vibrant street party takes place in the Paradise Garden section. The Three Caballeros (including Donald Duck and his pals Panchito from Mexico and Jose from Brazil) host the show from atop their float. You’ll see authentic mariachi and samba musicians in a brilliant blend of music. 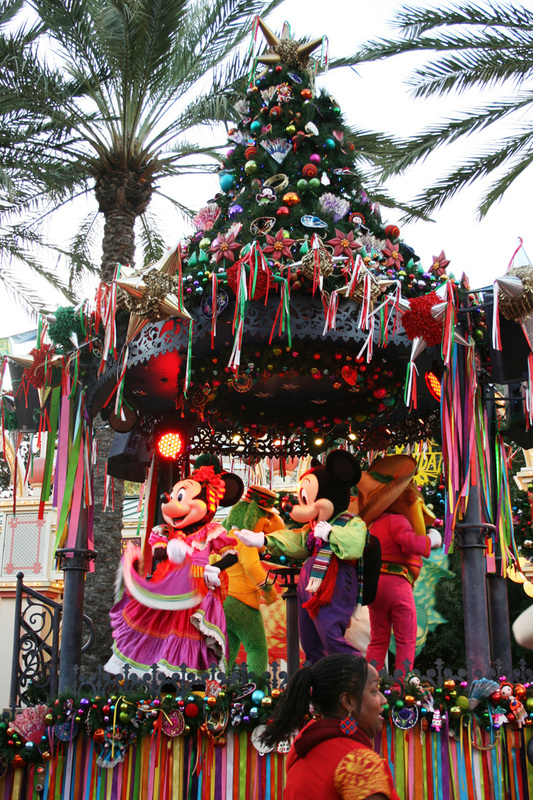 There are folklorico dancers, 12-foot-tall mojiganga puppets of Santa and Mrs. Claus, plus Mickey Mouse and Minnie Mouse on bikes. I highly recommend watching the show during daylight hours. I’ve watched the show in both day and night and I much preferred the daytime. This section of the park isn’t brightly lit at night and if you’re stationed at the end sections of the show, you may miss some of the details in the dim light. Fortunately !Viva Navidad! takes place several times a day so you’ll have lots of opportunity (to even watch more than once, if you wish!). TravelingMom Tip: For the best view, station yourself in front of Bayside Brews. This is between the Jumpin’ Jellyfish ride & Silly Symphony Swings, directly in front of the center entrance of the Paradise Garden Grill. The main float will park here and you’ll have a fabulous view of all the action and characters. 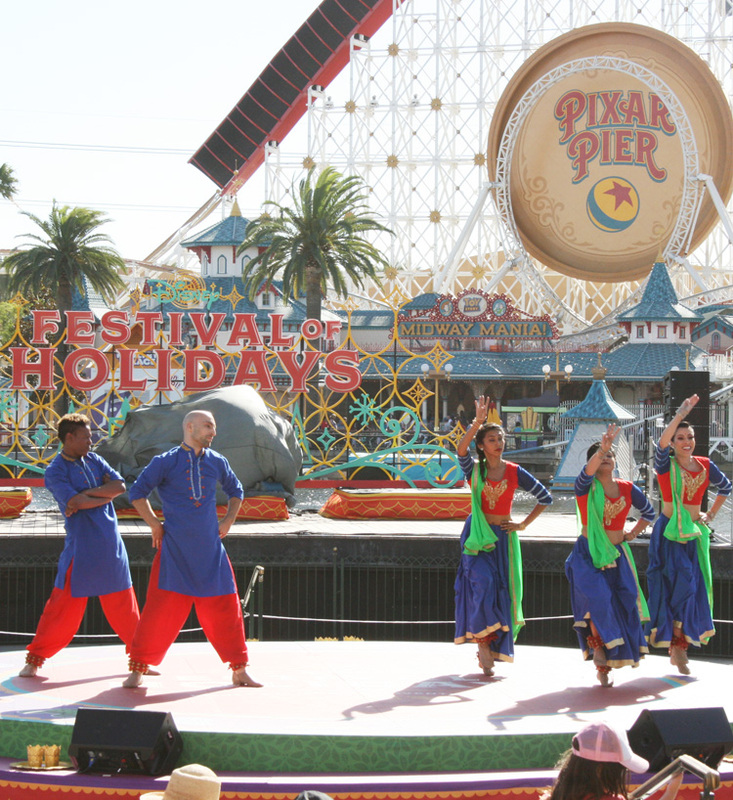 The entertainment offered during the Disney Festival of Holidays are meant to represent a variety of diverse cultures and seasonal celebrations. You’ll find entertainers celebrating Christmas, Kwanzaa, Hanukkah, Diwali and Latino culture. There are several different entertainment venues to find these acts. Be sure to check the Disneyland app for more details on exact times and locations. Kids will enjoy having their Tasting Passport stamped at each location. Simply hand it over when making your purchase and the Cast Member will stamp the page. After visiting each of the 12 kiosks, visit one of three locations (indicated in the booklet) to receive a Stamp of Completion. What a fun souvenir for the keepsake box! Food prices are on the high side and portion sizes are relatively small. Flip to the index in the back of your Tasting Passport to find all “kid friendly” dining options during the Festival of Holidays. This may help you choose more carefully when picking dishes to enjoy with your kids. 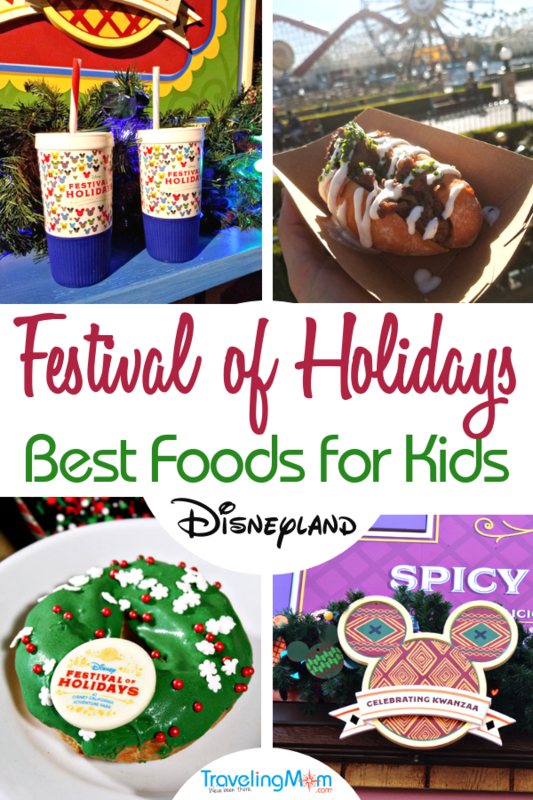 There are some sure bets when dining at the Disney Festival of Holidays with kids: Holiday Mickey and Minnie Cookies, Holiday Stuffing Mac & Cheese and the Gingerbread Mickey are must-try choices! Be sure not to miss !Viva Navidad! Kids will love seeing favorite characters and can dance along with the lively music. Children can also meet n’ greet with some of these characters in their festival costumes inside the Paradise Garden pavilion. Try arriving at an off-time (not immediately after the street party) to minimize your wait time. Find out more Disneyland tips for traveling with preschoolers. Tucked back in the Paradise Garden area is face painting (for a fee) and complimentary crafts. 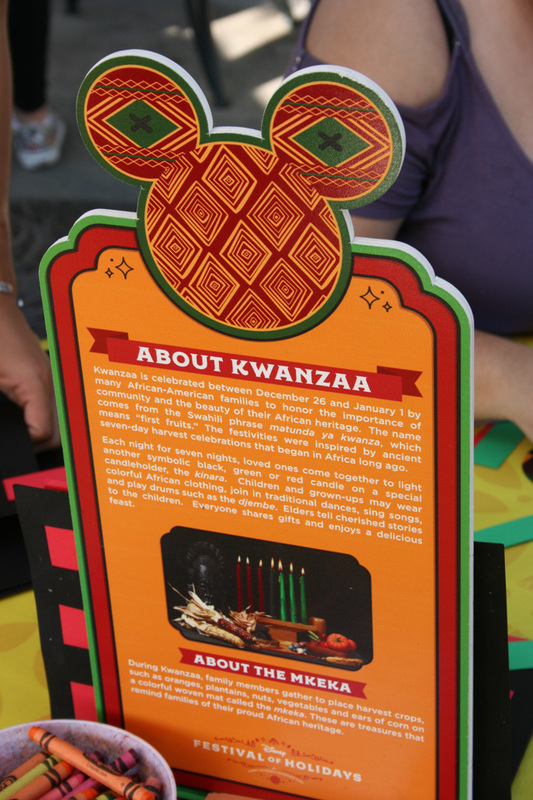 There were several craft offerings for different ages and abilities. 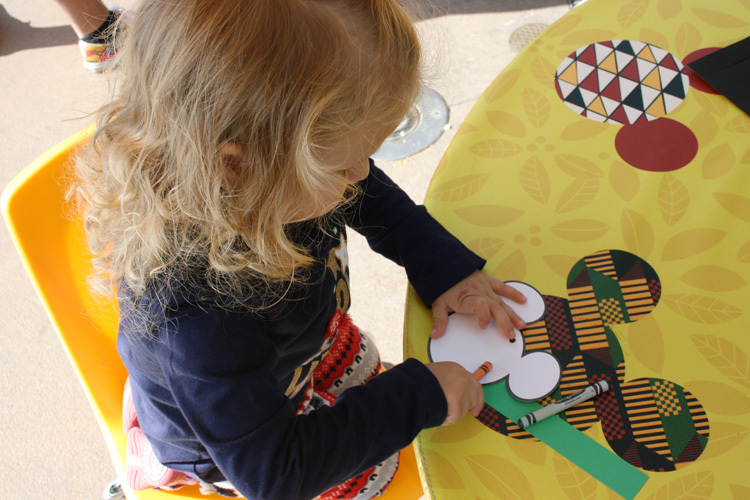 My toddler took time to color a Mickey shaped paper ornament, while older kids at the table were weaving paper strips into patterns in celebration of Kwanzaa. The gardens are decorated with colorful banners and piñatas. 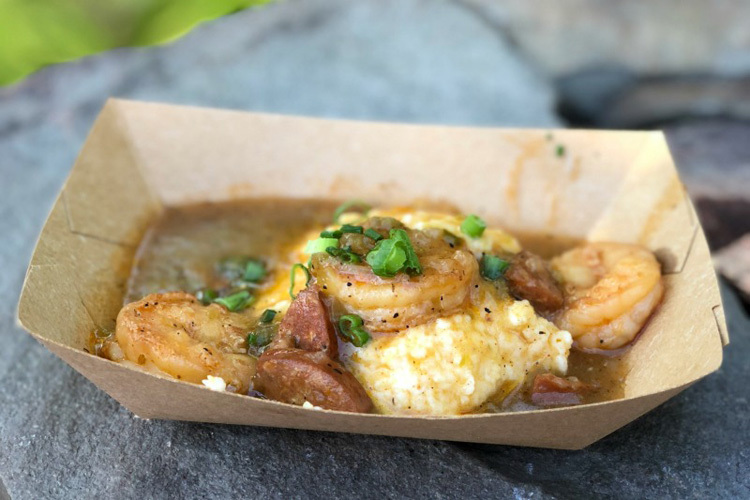 And if you’re looking for a heartier meal option than those found in the Festival marketplace, consider dining at the Paradise Garden Grill. The kids menu features cheese quesadillas and street tacos. Little fans of the Disney Junior show Princess Elena of Avalor will enjoy celebrating her arrival to the Paradise Garden area several times daily. Stay after to meet n’ greet when Elena will pose for photos and sign autographs. You’ll also find Goofy, Donald and Mickey with Minnie greeting in this area as well. When taking on the Disneyland Resort with kids, read more about the special holiday-themed rides available during this season.